On lightly floured surface, unroll dough. Using large ghost cookie cutter, cut out 6 or 7 ghosts; place on cookie sheet. Brush each with olive oil; sprinkle with cheese, making sure to clean up edges of ghosts. 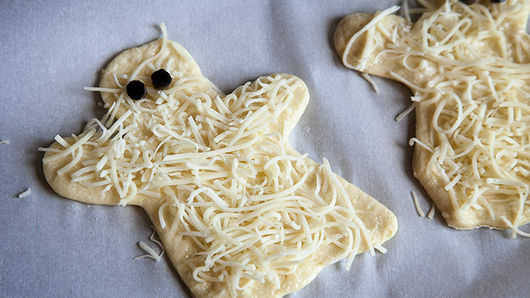 Any cheese left on edges will create messy-looking ghost once baked. Cut each olive in half; lay flat. Using small knife, cut little round eyes out from olive halves. Arrange olive pieces for eyes on ghosts. Bake 11 to 15 minutes or until very lightly browned. Remove from cookie sheet to cooling rack; cool 10 minutes. 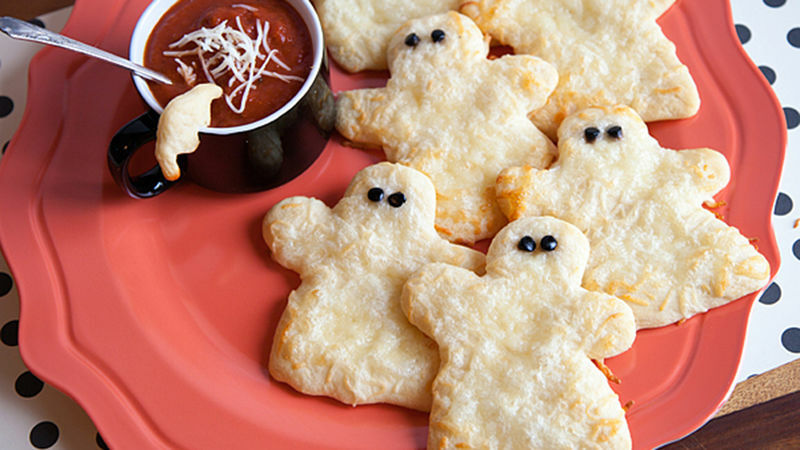 Serve ghosts with warm marinara sauce for dipping. If you don’t have a large ghost cookie cutter, create a ghost template out of card stock and lay it on your dough. Using a small knife, cut around the template to create your cute little ghosts. You can also use the tip of a round icing decorator tip to cut out the olive eyes. You can find garlic-infused oil in the oil section of your local market. It’s an easier way to keep your pantry stocked with this handy oil.